Sorbello stitch is an evenweave hand embroidery stitch that originated in the village of Sorbello in Italy and most people encounter it in traditional embroidery. It looks like a cross stitch with a knot in the middle – a textured cross stitch. This stitch is usually worked on a grid which means you can use this stitch as a substitute for cross stitches or you can use the grid like structure to give it a contemporary twist. 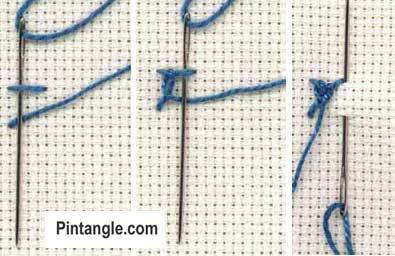 Sorbello Stitch is a very simple yet effective stitch and once you get into the rhythm it works up quickly. The step by step samples are worked over 4 squares of Aida using cotton perle #5 thread but traditionally Sorbello stitch is worked on a smaller scale. I made the samples larger so that it could be photographed in a way that people could see what was happening. Work this stitch from left to right. When working this stitch keep your tension slightly loose, particularly the top bar as it will tighten as you work more stitches. First make a stitch that wis a horizontal bar. This will form the foundation of the loop. Bring the thread through from the back of the fabric and make a horizontal straight stitch at the top of an imaginary square. Taking the needle diagonally across the back of the fabric bring the needle up through the fabric on the bottom left-hand corner. 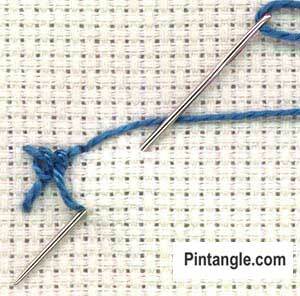 Slide the needle under the horizontal stitch. Make sure the working thread is kept to the right of the needle, so that when you pull it through it forms a loop over the horizontal bar stitch – as in the illustration. Slide the needle under the horizontal stitch a second time but this time keep the working thread under the needle to the left so that combined actions will form a knot. Take the thread through the fabric at the bottom right-hand corner bringing it out at the top left corner of the next stitch and repeat the process. As you can see the stitch looks like a row of cross stitches with a knot in the middle. 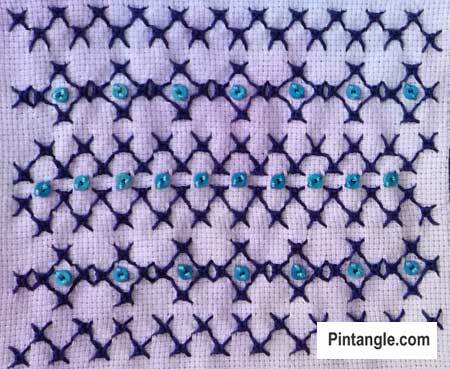 Diamond shapes form between the stitches and you can add beads or form patterns with how you space the stitch. 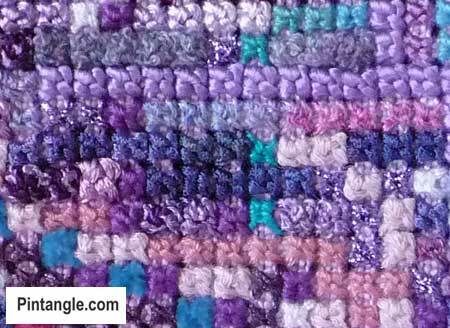 Sorbello stitch also looks great spaced to create patterns. I did do some sorbello stitch, although really late. Finally my Sorbello piece is finished, see http://borduurblog.blogspot.com/search/label/TAST . Later on I will post it to the Flickr group as well. here is the link showing the sorbello variation.i posted it in the blog too. finished my sorbello which was prime time fun. think i might have even invented something. please check my blog http://amovablefeast.blogspot.com. Almost late again but we are on a fishing holiday.As usual pretty wonky but such a pleasant stitch to do, lots of possibilities. I managed to do this stitch before the next one goes up. I am planning to use some of these TAST 2010 stitches on some crazy quilt blocks I have made, but I need to get other things done first. Just want to keep up now. Here it is, http://www.flickr.com/photos/37200176@N07/, ahead of time (for me)! There’s also a link to a larger photo on my Flickr-page. I posted my effort on http://www.flickr.com/photos/38196082@N05/4628946806/ . I would like to explore more with this stitch, but we just got a new puppy and she’s keeping me very busy these days. I’ve posted my sample on my blog. I was actually using half of this stitch on something else I’m working on – half because the square bit was already part of some plastic canvas. I didn’t post a picture of that but I probably will one day. Sharon, this stitch was a pleasure to work. Your lovely examples didn’t leave much room for further exploration, but I gave it my best shot. It’s also posted on Flickr. I put my example in my fotostream.This stitch is going to be one of my favorites. I like also the off-side – neatly arranged threads – not shown in my stream. Thanks Sharon! Hi Sharon I learnt this stitch through inaminuteago couple of years back. And worked a project on a dress. So I am not doing it again and posted the same in my blog. My example is up on the blog. 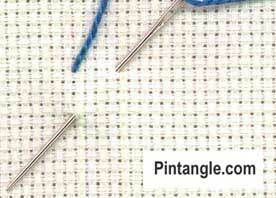 Hi Sharon I am late for Bullion Buttonhole stitch and early for Sorbello stitch. They are posted on my blog now. Very interesting! 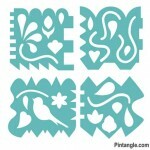 This one is great for embellishing a needlepoint surface – I’ll get started right away, as it gave me an idea.